I reached Haridwar on Tuesday afternoon, after passing the elephant gauntlet, and found my couchsurfing contact, Rohit. He owns and runs an English language school to the south of the city, which he also teaches at, along with his friend Sachin. Their hosting arrangements were basically the school premises, which although not exactly residential, provided basic facilities and a roof over my head. Rohit and Sachin were also both incredibly helpful when it came to finding solutions to the various bike problems I was suffering, so I can’t complain at all. The journey from Nainital to Haridwar was another long day of riding, though slightly shorter, and generally less eventful than the previous slog. So, instead of talking about the trip, I’ll give some general thoughts on Indian road journeys. Nainital is a hill station, one of the small towns just a short trip up into the Sivalik foothills of the Himalayas, either founded by the British (like Lansdowne, Mussoorie and Dalhousie) or expanded from a native village (like the Raj’s summer capital, Shimla, and Nainital), and used as an escape from the oppressive heat of the Indian plains. As well as being cool, refreshing, quiet and relaxing, Nainital’s USP is its beautiful setting around a small mountain lake. Well, I wanted adventure, challenge and the unexpected, and by god I got it. Today is not a day I’m likely to forget for a while. It started well, up early, packed and loaded, and setting off from Delhi at about 0730. The bike was a bit tricky to balance at first with everything on, but I got the hang of it quickly. I also learned another lesson: the ruck sack strapped across the back seat provides a handy back rest for long journeys. But only if you don’t put the knobbliest objects right where they jab you in the spine. The fourth day in Delhi was fairly uneventful. I’d been intending to go to Moradabad and stay with a couchsurfer to break the journey to Nainital, but he wasn’t responding to calls and texts, so I decided to go directly to Nainital the following day instead. Also, having spent the first few days hovering around a healthy 3-5, I plummeted to a 7, combined with a mild stomach ache. So I spent the morning in, feeling sorry for myself. By the afternoon I was a bit better, and went to meet another CS, Tanveer, who is from Srinagar in Kashmir, but studies photography in Delhi and works in a hotel on Connaught Place. We sat in the cool, air-conditioned lobby of his hotel and looked at his photos of Srinagar and other places in Kashmir. It all looks very beautiful. He kindly offered to let me stay with his family if I go to Srinagar. In the evening, we went out to visit some family friends, and discussed travel plans. Apparently the Valley of Flowers is closed due to the monsoon floods. I was strongly urged to consider going to Leh, riding there from Manali then across to Srinagar, completing a loop via Jammu and Amritsar. I had a bit of trouble kick starting the bike this morning. I’ve never had a bike that needed kick starting before. Although that’s just a specialised case of the general fact that I’ve never had a bike before. But the bikes I’ve learned on have always had electric start. The Bullet has electric start too, but first thing in the morning it needs to be kick started, and then can be electric started after that. I struggled with the kick start this morning, quickly building up a sweat in the Delhi heat, to no avail. Then I tried the electric start, and it worked. I rode back to Karol Bagh with Sadhana: my neighbour’s sister and the person whose family I’m staying with in Delhi. We stopped at Tony Bike Centre, and I asked them to take a look at the kick start. They confirmed that the problem wasn’t with the kick start, it was with me. So they showed me a few more times, and I practised, and started to get the hang of it. I also got them to adjust the back brake lever up a little, more as an excuse for turning up than anything. After a delicious South Indian style breakfast of dosa (rice pancakes), daal and coconut chutney – I’m not in danger of starving here, but maybe of being forcefed until I burst – we changed Traveller’s Cheques and got a Vodafone prepay SIM card. Having left my iPhone at home, I’ve now realised the utility of having a smartphone, so tomorrow I’ll try to get a cheap one for email and GPS/maps. No time for that today though, as I had to get the bike. I arrived in Delhi yesterday. Everyone says India is a shock when you arrive. And I was surprised: by how quiet it was. Delhi airport at 7am isn’t the hectic chaos I was expecting. Nor was the Metro Airport Express, nor was the street outside Shivaji Stadium station, where I was supposed to wait for my friend Nidhi to pick me up. I was waiting for about 20 minutes, so by the time she arrived, I’d made several more friends already, like the autorickshaw driver whose brother (not really his brother) was studying in Birmingham. 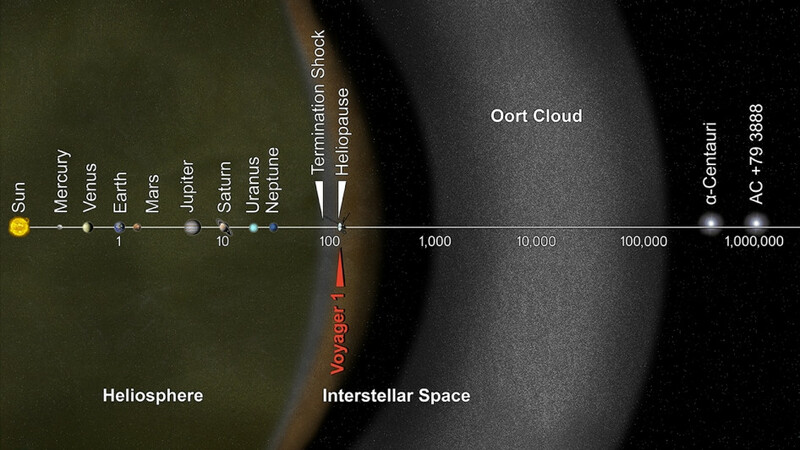 Yesterday, NASA published a logarithmically scaled map, below, of the solar system and surroundings, to accompany the news that Voyager 1 has left the heliosphere and entered interstellar space.